Living in Kuala Lumpur, I have been driving a car around since I retrieved my driving licence at 17 years old. We all know that it's the best and most convenient way to travel around the city. I have been changing cars over the years. As a car owner, I had been through a lot of hassle when I tried to sell my old cars. For examples, the buyer might not be able to buy my car as sometimes loan is not approved and there is no confirmation that the buyer will buy my car. I especially hate verbally promises which usually leads to big disappointment and frustration. I remember the last time I wanted to sell my previous car, I had to visit several used car dealers to get a quote. It was time consuming and each of them told me differently about my car condition. I was so frustrated and can’t decide to whom should I sell my car to. Sometimes, I even receive PM from my listing post that are obviously scams I really hate! Furthermore, there are so many paperworks that I need to go through without anyone helping or guiding me. So when my car started giving me problems last few months, I had decided to sell it off to buy a new car. Coincidentally, I discovered Carsome ads on Facebook and I found it interesting. Hence, I have done some research on Carsome. Carsome was first launched in Malaysia, then expanded to Singapore, Indonesia and Thailand. Car owners like me feel so relief with the service provided by Carsome. Step 1. Go to Carsome's website and submit your car and contact details to get an estimated price. If you agree with the price, you may select your preferred date and time for inspection. Step 2. 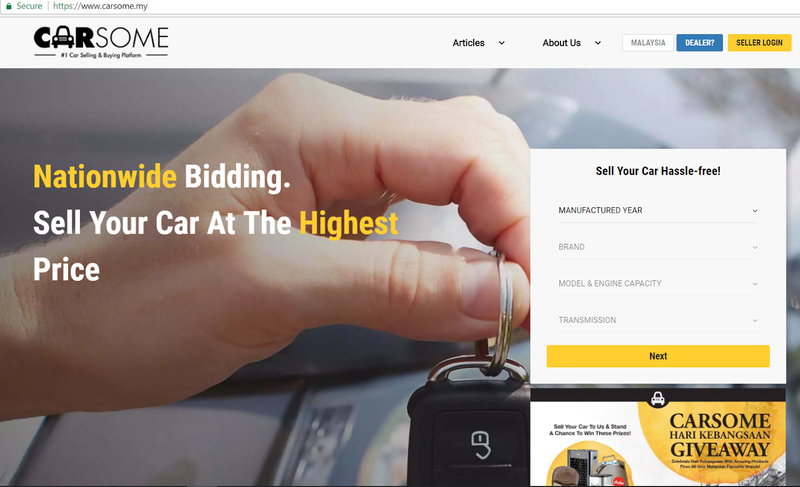 Carsome‘s customer service team will contact you to verify your details and confirm on the inspection appointment and guide you through the selling process. They will also advise on the documents that needed to bring for the inspection. Step 3(a). Attend the inspection and Carsome's inspector will give you a final offer based on your actual car condition. If you agree with the price, proceed to Step (4). Step 4. 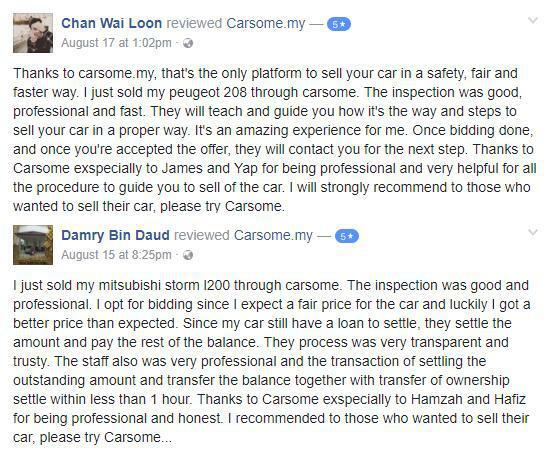 Carsome will handle all the paperwork (JPJ, PUSPAKOM & etc) and the payment will be transacted immediately. Isn't it fast, fair and cool? Furthermore, Carsome's services is free hence we don't have to pay a single cents to sell our car. No charges on the paperwork and using thieir bidding platform. It is all up to us to decide! Now, why not go try it out. If you still have doubts, you can read these reviews that I’ve got from Carsome’s Facebook! They have a total of 3400+ cars that are sold to them. As you all know my current car is giving me a lot of problems, I am in the midst of changing to a new car. Therefore, I would definitely sell my old car via Carsome. In case you didn‘t know, Carsome will send me home with Uber/Grab after I sell my car to them and I don’t have to worry how do I get home. Oh, and they even have a reward program, Carsome+ for their customers that sold thieir cars to them. 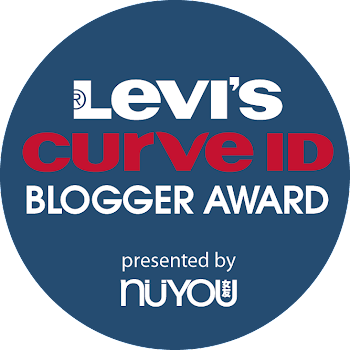 Good for people who likes to shop, just like me! 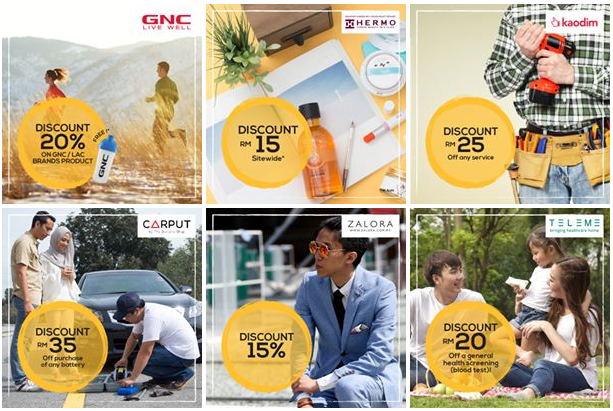 They have discount codes from a variety of famous brands, such as Hermo, GNC, Zalora, Carput and so on. This is really an awesome service! I am glad that Carsome is here to solve car sellers’ problems. To the sellers out there, what are you waiting for? Submit your car details in the form below to enjoy the hassle-free car selling service now. I've heard of Carsome but never tried their service. Thanks for sharing your experience. I have seen this website before. It is true very convenient to have this kind of option nowadays. Selling a car always sounds cumbersome with too many procedures in place. If it can be done this easily, there's no better way. Moreover, the paper work is taken care of too. Brilliant!! This is a good place to sell your car. Last time Perodua helps me to find a good dealer. Hassle free. First time hearing Carsome, thanks for sharing. & it's good effort of them to have their inspection centres open 7 days a week. I'm in the midst of selling my car and experiencing a lot of issues. Too bad Carsome is only available in KL and Selangor. This is my first time heard of the service. If I had known this earlier, selling my 2 cars would have been easier. I always wondering, how people selling their car. Hehehe this website is another alternative and have very good feedback. wahh.. i've read it somewhere and it seems a good platform! thank you for sharing! Good info. Thanks for sharing. I will let my mom know. She want to sell her car too. Thanks for the infor, i m thinking to change to a smaller car that is easier to park.